So far this month we have figured out where our money is going, figured out who we owe money to and we talked about budget basics. Today we are going to talk about developing a plan to pay down your debt. There are so many plans and so much advice out there on paying down your debt. So I am just going to share what worked for us. It’s been almost two years since my husband and I dug our way out of $36,000 in debt. It took us two years to pay off this amount on one income (and we had our second baby during that time). In the past, I have likened our debt to a backpack full of bricks. And when I think about it, I still feel that way. Our debt was the result of Jason’s leftover student loans (after eight years of paying on them!!) some credit card debt and some medical bills. Today I wanted to share some of the steps that we took to pay off that debt. So we listed our debts largest to smallest and paid off the smallest first… with the exception of Jason’s student loans. That’s over $1,100 a month in debts! No wonder we were so broke! A lot of programs suggest that you list your debts largest to smallest and pay them off that way. While I agree with that, for us, the exception was student loans. Here are my thoughts on that. If for some reason we came into a crisis and had to pause our debt payoff we could defer Jason’s loans. But you can’t defer feeding your kids. So Jason and I felt it would be better for us to pay off the credit cards, even if they were larger than to pay off some of Jason’s smaller student loans. Instead, we decided to put extra money into savings and pay off those student loans in one lump. Step 3. Put some extra money in savings. Before we even began to put money toward our debt we put a little into savings. For those of you who follow Dave Ramsey, he suggests a $1,000 emergency fund. I am no expert, but I can tell you first hand the emergencies we’ve run into have rarely been below $1,000. I wanted to triple that emergency fund. So we socked extra cash away by cutting out some of the expenses we just didn’t need. Our next step was to find out where we were throwing away money. There was our grocery budget... which was non-existent. There was our $100 + a month cable bill. Eating out. Etc. Etc. We had to cut out our money wasters and do so immediately. That meant pulling the satellite dish off the house and sticking to a strict grocery budget. Step 5. Find extra money. Around the time we started paying off our debt I began my little side business as a virtual assistant. I was surprised when I almost immediately found clients and began making money. All of this extra money went toward our debt, which allowed us to pay it off faster. I realize that is easier said than done. If you’re looking for a way to earn extra income be sure to check out this post on 10 Side Hustles you can do. Chances are you didn’t get into debt overnight, so you’re not going to get out that quickly either. 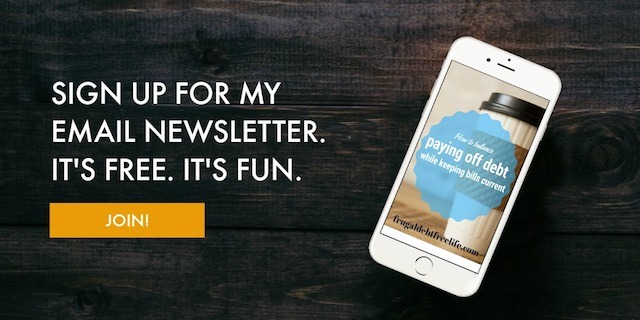 We took things slow and steady and in the middle of our debt payoff, we hit the pause button in the months leading up to our second son’s birth. We chose to put that money in savings in case an emergency were to arise. At times, it felt frustrating and I thought we would never be out from under the thumb of debt. It would be very easy to get frustrated and give up. But don’t. There is a light at the end of the tunnel and hope. It just takes a plan and a little work. What about you? What steps did you take?